Who’s looking for a great spring project? Are you searching for a great car to take to the next Radwood? 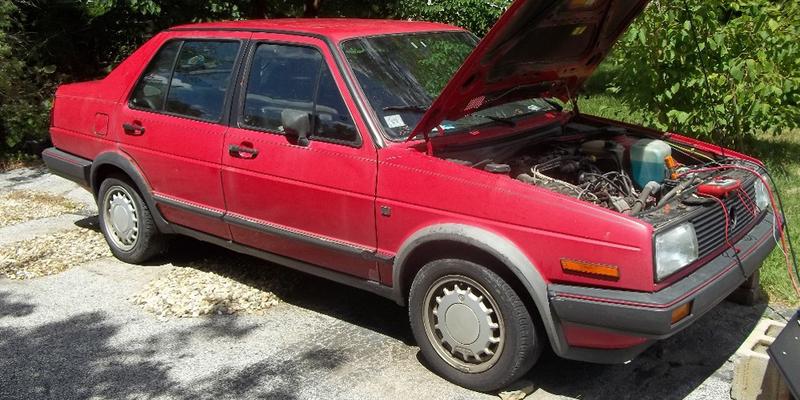 We have a perfect contender in this week’s Ratty Rescue: a 1987 Volkswagen Jetta GLI. Car lovers around the world know what these three letters on the back of a certain hatchback mean: GTI. The letters transform a simple economy car into the famous hot hatch. GTIs have additional horsepower from a high-compression 8-valve engine, close-ratio manual gearboxes, improved suspensions, lightweight alloy wheels, and some trim enhancements to differentiate the quicker bunny from its more sedate siblings. Volkswagen took this same recipe and baked a slightly different cake: the Jetta GLI. Pulled right from the GTI, the GLI has the same performance add-ons. These extras transform the humble car into an entry-level performance sedan. The GLI has all the fun of the hatch, but with the additional practicality of four doors and a large trunk. The GLI can shuttle the family around during the week, then hit the track on the weekend. This 1987 GLI has a ton of potential. From the outside, it looks like all trim is present. Well, except for the front emblem. Let’s assume it was stolen and used in a Beastie Boys video. Even the OEM “bottlecap” wheels are present. Like any car from the Midwest, this one has a bit of rust, but nothing terrible. Mechanically, the car needs some work, but the seller says it runs. The exhaust system needs attention. Included in the sale, though, are some new parts, repair manuals, and some repair tools. The seller even has some documentation of the car’s history. Nice! There aren’t any photos of the interior, so you’ll need to check that out for yourself. The as states the car has an Alpine stereo and a sunroof. This 1987 GLI is located in Valparaiso, Indiana. Current asking price: a very reasonable $1875. Check out the ad on Autotrader.com.